A colleague of mine, who is a dog trainer in Oakland, CA, and I were talking about how dogs, if they could reason, would likely be big proponents of the above quote, because this is very similar to their view of the world. From a dog’s point of view, everything is okay unless someone says otherwise. This means your dog will feel free to do whatever pleases him (as I’m sure you’ve noticed) and unless you let him know, in a way he understands, that it’s not cool, he’s going to keep doing it if he feels so inclined. Your dog doesn’t ask to jump all over guests who enter your home – he just jumps (and he enjoys every minute of it). Your dog doesn’t ask to bolt out the front door whenever you open it for the delivery guy – he just bolts. Your dog doesn’t ask if it’s okay to snarl at you while you clip his nails – he just snarls. Your dog doesn’t ask if it’s okay to growl and lunge at passing dogs while you walk him down the street – he just does it. Let’s say there are two dogs living together in the same family. One dog has a particular liking for a particular bone, and he settles down to get a good chew in. The other dog is wandering the house, and decides to settle down on the couch. Okay. Then he decides to go play with a ball. Okay again. Then he wanders into the room where the first dog is chewing his bone. Also okay, until he wanders directly up to the dog with the bone. This is not okay, so the dog with the bone gives him a little snarl. The other dog backs off, and returns to wandering the house. In this example, the wandering dog was happy to assume that all of his actions were okay. When he stumbled upon an action that wasn’t okay, his feelings weren’t hurt – no damage was done by drawing a line in the sand. He simply received the communication, and moved on. So, it’s safe to say that unless you tell your dog “no” to the things you don’t want him to do, life is a free for all! A dog’s approach to “rules” is starkly different from our human understanding of the subject. As creatures that can reason, we are able to explain to each other what behavior is expected, and what behavior is forbidden. Dogs are bright, but they can’t reason. Your dog views the world through his “it’s all good” lens. He may understand that humans are different, but he assumes we view the world the same way he does. He fully expects to be told “no” if something’s not okay. This means that if we’re being inconsistent with any of our rules, we are creating confusion, and the dog is likely to assume his “it’s all good” approach to the situation. At the very least, if there is confusion, you can expect the dog to keep on testing. Now that you understand how he views the world, can you blame him? If there’s a communication break down between you and your dog, try looking at the “rules” from his point of view. If something is not okay, you need to consistently let him know. Don’t tell him twice and then get frustrated the third time around because he’s “not getting it.” He may need some more time, or you may need to re-examine how you’re telling him no, especially if the dog completely disregards your no. There are lots of methods out there, so ask yourself “is this method of saying no meaningful to my dog?” If it’s not meaningful to your dog, then the message is unclear, and the problems will continue. If you are having trouble explaining to your dog that certain behaviors are unacceptable, there is lots of quality help available. There are lots of dog trainers out there who are fully capable of saying no in a way that is consistent, clear, meaningful, and yes, humane. There is nothing wrong with the word no – if you have any doubts, just watch two dogs interacting. It’s important to understand how your dog views the world, and how dogs communicate with each other. I do incorporate this knowledge into my approach to dog training, but I also go one step further. I believe it’s just as important to teach a dog the right thing to do, and to encourage him when he does it. While the dog is learning the “right” things to do, I always set the dog up in a position of success to the greatest extent possible. After all, we’re the ones with the opposable thumbs, right? 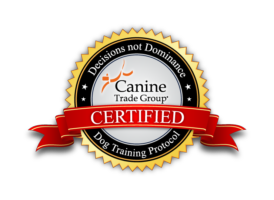 I’m an experienced professional dog trainer, and my approach to dog training encourages a relationship of mutual trust and respect between the dog and his human family. If this sounds like the kind of relationship you’re looking for, I’d be happy to work with you and your dog.